See race video via Flotrack. There comes a time when an ageing or no longer dominant 400m sprinter decides to move up to the 800m. Usually it’s the coach who decides this. I’m not sure of Jeremy Wariner’s case. Why would you want to move up? For me, anything over 400 meters I take a taxi. But seriously, there are several factors. The number one reason is they aren’t getting any faster in the 400m. They have stagnated in progression. 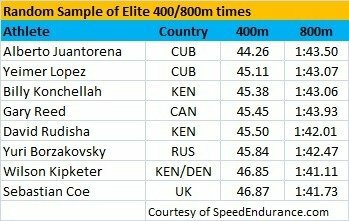 Most of these coaches train their 400m long to short. And you wonder why their speed or acceleration development hasn’t progressed? But by using a short to long approach, these same coaches assumes it’s easier to train for speed endurance (and special endurance), and thus the decision to move up to the 800 meters. It’s a bit ironic, isn’t it? You have to break the ice sometime. But when you see a 400m sprinter with 43+ speed going through 400m in 55 secs, that is jogging with all that speed reserve! So, based on his raw 400m speed, and if the training is in place, what should (could?) he run? I remember watching Adam Steele, the 400 meter 2003 NCAA Outdoor champion from the University of Minnesota, move up to the 800m and never materialized. I’ve seen several theoretical calculators, from the “4 seconds per lap rule” for distance events, “5 seconds per lap rule – or double 400m time plus 10 seconds” and even as high as double 400 meter time plus 12 seconds. Canada’s Gary Reed is very close to double plus 10 second conversion. If you use the double 400m plus 12 second rule, you will see a 50 and 1:52 for a 400/800 combo. But I’ve seen guys break 1:50 but never go under 50. And I’ve seen guys break 50 but run 1:55. Or 1:59 in my case. It’s like asking, which is tougher, 45.55 or 1:45.40? These were the 2009 Berlin WC IAAF “A” standards. The “B” standards are 45.95 and 1:46.60. 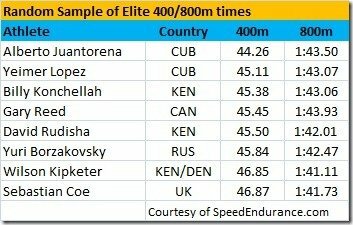 If you do the math, that’s double 400m time plus 14 seconds! Or 7 seconds per lap. So you know what you can do with that calculator, right? The bottom line is: You need 400m speed to run a good 800 meters. Period. Don’t argue with me. READ Who Won the Shoes War? PUMA, NIKE or ADIDAS? Sometimes, you have to ask a 800m runner to run a 4×400 (a relay where you can use 200m, 400m, 400mH and 800m runners). Canada did this in ‘88 with Paul Osland and ‘92 with Freddie Williams. Speaking of Kenya, David Rudisha is a good example. He closed his 2009 season with a Sept 09 1:42.01 at Rieti. 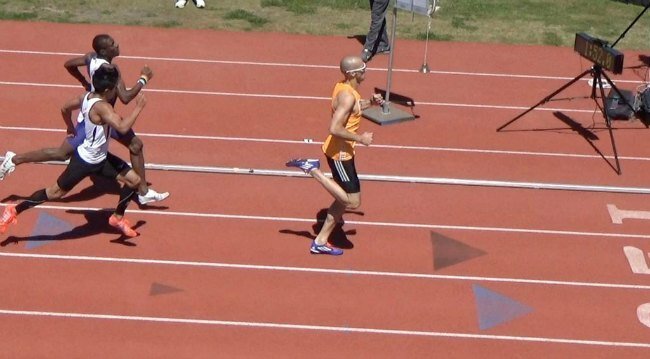 Then in early 2010, he ran a 45.50 400 meters plus a 1:43.15 in Melbourne, winning by 3.5 sec! How does 45.50 and 1:42.01 rank? So what can Jeremy Wariner potentially run?